Market capitalization is equal to the share price multiplied by the number of shares outstanding. As outstanding stock is bought and sold in public markets, capitalization could be used as an indicator of public opinion of a company's net worth and is a determining factor in some forms of stock valuation. Market cap reflects only the equity value of a company. It is important to note that a firm's choice of capital structure has a significant impact on how the total value of a company is allocated between equity and debt. A more comprehensive measure is enterprise value (EV), which gives effect to outstanding debt, preferred stock, and other factors. For insurance firms, a value called the embedded value (EV) has been used. , where MC is the market capitalization, N is the number of shares outstanding, and P is the closing price per share. For example, if a company has 4 million shares outstanding and the closing price per share is $20, its market capitalization is then $80 million. If the closing price per share rises to $21, the market cap becomes $84 million. If it drops to $19 per share, the market cap falls to $76 million. This is in contrast to mercantile pricing where purchase price, average price and sale price may differ due to transaction costs. Not all of the outstanding shares trade on the open market. The number of shares trading on the open market is called the float. It is equal to or less than N because N includes shares that are restricted from trading. The free-float market cap uses just the floating number of shares in the calculation, generally resulting in a smaller number. Traditionally, companies were divided into large-cap, mid-cap, and small-cap. The terms mega-cap and micro-cap have also since come into common use, and nano-cap is sometimes heard. Different numbers are used by different indexes; there is no official definition of, or full consensus agreement about, the exact cutoff values. The cutoffs may be defined as percentiles rather than in nominal dollars. The definitions expressed in nominal dollars need to be adjusted over decades due to inflation, population change, and overall market valuation (for example, $1 billion was a large market cap in 1950, but it is not very large now), and market caps are likely to be different country to country. 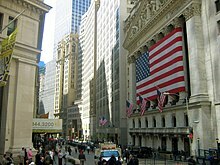 ^ "Market highlights for first half-year 2010" (PDF). World Federation of Exchanges. Archived from the original (PDF) on July 22, 2013. Retrieved May 29, 2013. ^ a b "Market Capitalization Definition". Retrieved April 2, 2013. ^ "Financial Times Lexicon". Retrieved February 19, 2013. ^ "Mega Cap Definition". Retrieved April 2, 2013. ^ "Micro Cap Definition". Retrieved April 2, 2013. Look up market capitalization in Wiktionary, the free dictionary.